with Chief Islander Ian Lavarello alongside Tristan Government UK Representative Chris Carnegy. At the reception staged by the Foreign and Commonwealth Office to mark the end of the 2018 Joint Ministerial Council, Tristan da Cunha was given centre stage. In his speech, HRH the Duke of York reflected on the the Queen’s meeting the previous night with Chief Islander Ian Lavarello. He invited Ian to tell the assembled dignitaries how a return home in February meant four months’ travel to be at the JMC! 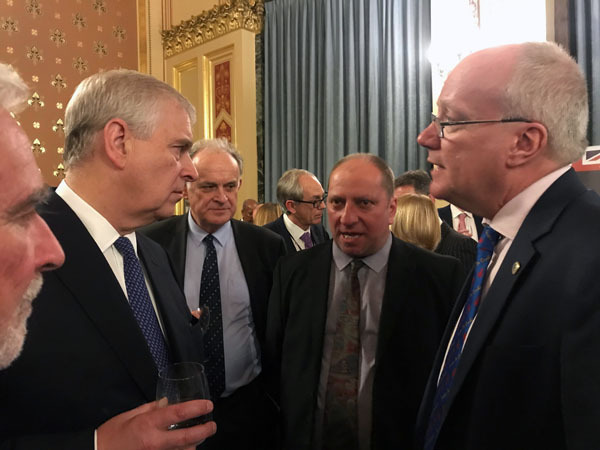 The Duke then talked with Ian, and UK Representative Chris Carnegy, about the dynamics of Tristan’s key trade, the export of gourmet lobster. 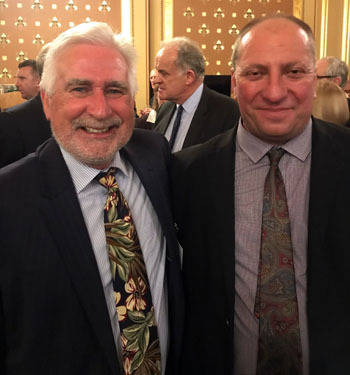 Ian Lavarello with Pitcairn councillor Leslie Jacques.